Absurd Wurld: Whose Afraid of The Art of Noises? Whose Afraid of The Art of Noises? One of the foremost music producers of the 1980s was the British musician and producer, Trevor Horn. Horn, known for his utter fastidiousness and attention to detail, first came to prominence with The Buggles, briefly joined Yes and then settled into a role producing the most sumptuous, crafted pop of the decade. ABC's The Lexicon of Love, The Pet Shop Boys's Introspective and Yes's 90125 are all examples of his work as are Relax by Frankie Goes To Hollywood, Duel by Propaganda and Slave To The Rhythm by Grace Jones. Between 1983 and 1985 Horn could do no wrong. He was named Producer of the Year in two of those three years and, besides much of the stuff I've mentioned here, he also managed to sign and be involved with a band called The Art of Noise. How much he was involved with them is now a matter of dispute as the team Horn had put together, Anne Dudley, programmer J.J. Jeczalik and Gary Langan, would acrimoniously split with him and the pretentious journalist, Paul Morley, who, on his own admission, had forced his way into the collective as he liked the name so much. 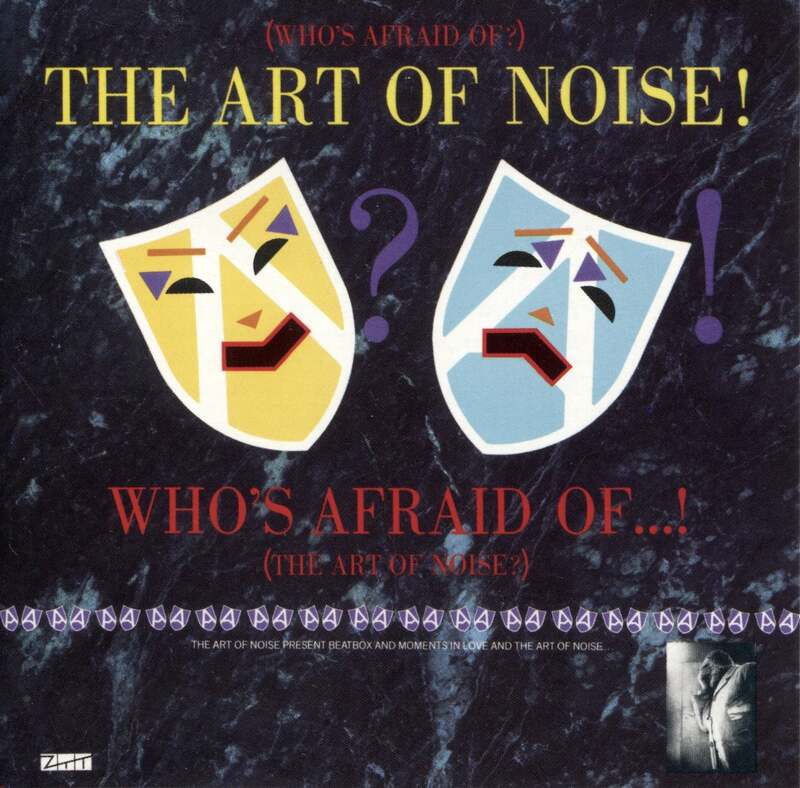 The Art of Noise did have some high points. Wikipedia describes them as an "avant-garde" group. Their name was taken from a pamphlet written in 1913 by an Italian futurist painter called Luigi Russolo, "The Art of Noises". (Jeczalik had insisted The Art of Noise dropped the "s".) Perhaps their best album (because most original) is their first, Whose Afraid of The Art of Noise? which contains their well known tracks Beat Box, Close (To The Edit) and Moments in Love. Their sound had first appeared in the Yes album 90125 as the core workers in the group had been the team Horn had put together to help him with his production work. It was based around use of sounds or noises and facilitated by the Fairlight computer which enabled sounds to be input and then manipulated to musical purposes. Horn and The Art of Noise weren't the only ones doing this at that time though. Peter Gabriel and Jean-Michel Jarre were amongst others enthusiastically embracing this technology. The 1980s was really when the sampling revolution took hold as devices were invented which made the tape manipulations of earlier decades of the 20th century obsolete. Quite what Luigi Russolo would have made of this himself we will never know but we can read his futurist manifesto on the future of music and make an educated guess. As stated above, Russolo himself was a painter and the immediate temptation is to imagine that he thought of sound much as he thought of paints, things to be mixed and used on a canvas in innumerable combinations to create textures and mixtures as yet unthought of. This seems to be the way he is thinking when he writes in The Art of Noises that "We must break at all costs from this restrictive circle of pure sounds (by which he meant the conventional orchestra) and conquer the infinite variety of noise-sounds." This thought in itself gives away at least one motivating factor in Russolo's writing on this subject: he conceives of music in terms of its constituent parts, as sounds. I think this is a very important thing to note and probably more so then the actual text of The Art of Noises, although there is much in it that is noteworthy too. Music is made up of sounds. It is to me a revolutionary thought and something that I think needs to be thought about and meditated on again and again by all musicians. But what of the content of The Art of Noises itself? Well, the pamphlet is in the literary form of a letter addressed to an acquaintance of Russolo's and only takes about 25 minutes to read. Its not long but a concise argument for how music should proceed in the future and what it should focus on. In even such a brief treatise Russolo manages to criticize a music he sees as standing still based on orchestral sounds a number of times and seems very animated that musical art should not mark time but move forward. This lazy fixation with conventional sounds Russolo links back to The Greeks "with their musical theory mathematically determined by Pythagoras, according to which only some consonant intervals were admitted." This, according to Russolo, has "limited the domain of music until now and made almost impossible the harmony they were unaware of." What strikes me about this description is Russolo's recognition that any definition of canonical sounds or sound-making devices (such as the instruments of the orchestra) leaves out a whole world of sounds. Why should they not find musical uses too? Russolo perceives of a greater harmony than any traditional orchestra is capable of. "Some will object that noise is necessarily unpleasant to the ear. The objection is futile, and I don't intend to refute it, to enumerate all the delicate noises that give pleasant sensation. To convince you of the surprising variety of noises, I will mention thunder, wind, cascades, rivers, streams, leaves, a horse trotting away, the starts and jumps of a carriage on the pavement, the white solemn breathing of a city at night, all the noises made by feline and domestic animals and all those a man's mouth can make without talking or singing." This is, of course, but a short catalogue of many other possibilities. Russolo's point is that noises previously thought of as "unmusical" are not simply "unpleasant" and much less undesirable. His point is that some noises are pleasant in any case, if not currently connected with musical purposes, and that the musical uses of sounds stretch further than a tiny number of canonized instruments and the sounds they can make. This latter point was the thing The Art of Noise took up in their work utilizing the possibilities of the Fairlight to integrate these so-called non-musical sounds into their productions. Such sampling is today a commonplace occurrence and can be done on numerous devices or any home computer device with suitable software installed. But it is not the case that Russolo sees the future of music as the reproduction of noises in the environment for he goes further than reproduction. Indeed, he explicitly warns that "the art of noises must not be limited to a mere imitative reproduction". This opens the door to the creation of noises - new sounds! "Noise accompanies every manifestation of our life. Noise is familiar to us. Noise has the power to bring us back to life. On the other hand, sound, foreign to life, always a musical, outside thing, an occasional element, has come to strike our ears no more than an overly familiar face does our eye. Noise, gushing confusely and irregularly out of life, is never totally revealed to us and it keeps in store for us innumerable surprises for our benefit. We feel certain that in selecting and coordinating all noises we will enrich men with a voluptuousness they did not expect." This paragraph is fairly dripping with the idea that in a music of noises is a vitality that will not be denied. I thought of this paragraph when reading a question that was recently posed in my Facebook group, Electronic Music Philosophy. There someone recently asked about avant-garde music and what the other members of the group thought it was. I think that what Luigi Russolo talks about is, a music focused on noises and sound. A music that wants to explore timbre, that is avant-garde. It may be that such a music is not recognized by some even as music. And there's nothing at all wrong with that. Such a music should not feel comfortable with the popular praises or the disguises of mainstream thinking and ideas. It should aim to serve as a stumbling block for those who cannot see past their conventions. Even today in 2016 with our synths with "mutate" buttons a music of noises is yet to fully build on the impact that people such as Russolo himself made. 1. "We must enlarge and enrich more and more the domain of musical sounds... This need and tendency can be totally realized only through the joining and substituting of noises to and for musical sounds." 2. "We must replace the limited variety of timbres of orchestral instruments by the infinite variety of timbres of noises obtained through special mechanisms." 3. "The musician's sensibility, once he is rid of facile, traditional rhythms, will find in the domain of noises the means of development and renewal, an easy task, since each noise offers us the union of the most diverse rhythms as well as its dominant one." 4. "Each noise possesses among its irregular vibrations a predominant basic pitch. This will make it easy to obtain, while building instruments meant to product this very sound, a very wide variety of pitches, half-pitches and quarter-pitches. The variety of pitches will not deprive each noise of its characteristic timbre but, rather, increase its range." 6. "This new orchestra will produce the most complex and newest sonic emotions, not through a succession of imitative noises reproducing life, but rather through a fantastic association of those varied sounds." 7. "The variety of noises is infinite... We will not have to imitate these noises but rather to combine them according to our artistic fantasy." 8. "We invite all the truly gifted and bold young musicians to analyze all noises so as to understand their different composing rhythms, their main and their secondary pitches. Comparing these noise sounds to other sounds they will realize how the latter are more varied than the former. Thus the comprehension, the taste, and the passion for noises will be developed. Our expanded sensibility will gain futurist ears as it already has futurist eyes. In a few years, the engines of our industrial cities will be skillfully tuned so that every factory is turned into an intoxicating orchestra of noises." Recently when looking through a Facebook group focused on modular synths I came across a person who had asked a question of the group. He was new to modular synthesis but had noticed in his researches that, to paraphrase, "not much music of the song variety" seemed to be made with this equipment. He had presented his question as one looking to move forward in his own music making in equipment terms and yet it seemed that his thinking about music had not similarly been given the necessary kick from behind to accompany this. Perhaps this was an example of a phenomenon I have covered before - the fixation on equipment. If so, it would be a perfect example of how fixation with things takes over and stunts the growth of ideas which is vital to a forward-thinking musical outlook. Here was a man who wanted to get hold of new equipment, modern technology the likes of which many electronic pioneers would have begged for, but he wanted to restrict it to fairly basic ideas of what music even was. It did not even occur to him that with new equipment he could explore new ideas or maybe even forget the things he thought and go off down some dark, musical alley and find himself a new set of ideas. Such a person was Luigi Russolo, the futurist painter with an interest in future music. His manifesto for enriching, expanding and learning from a new palette of sounds is still relevant to music makers today. This is the area in which I think avant-garde composers and music makers should be focusing on, particularly in the electronic arena with which I am primarily concerned. It is pitched at a level far below concerns with melody or counterpoint or harmony. It is focused on sounds and noises themselves in all their difference and similarity, in all their possibilities for combination, comparison and juxtaposition. To make such music will be risky. It will be to be seen as maybe even being unmusical. But, especially with all the tools now at our disposal, it is a task that we electronic music makers would be irresponsible to ignore. The art of noises is still the future. The problem is many of them aren't Martin!